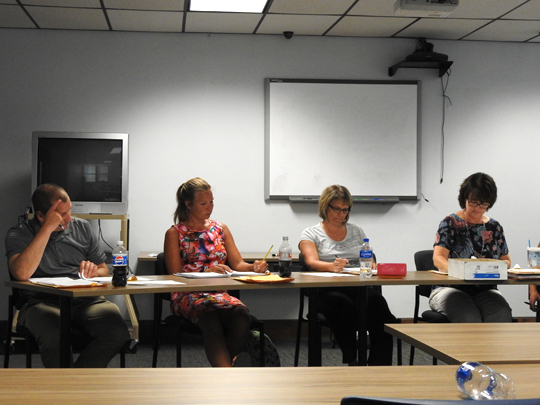 Garrett Neese/Daily Mining Gazette Lake Linden-Hubbell Public Schools Board members Jeff Dennis, Jennifer Beaudette, Amy Codere and Patricia Burton listen to an update on proposed raises at Monday’s meeting. The board approved raises for the superintendent, elementary coordinator and non-contract support personnel. LAKE LINDEN — Wages for Lake Linden-Hubbell Public Schools’ superintendent elementary coordinator and non-contract support personnel are going up. The district Board unanimously approved the raises at its meeting Monday. Non-contract personnel will go up 1 percent, while Superintendent Craig Sundblad and Elementary Coordinator Brad Codere will receive .75 percent raises. Sundblad also received a one-time contribution of $1,500 to a tax-deferred annuity, which will be available upon retirement. The .75 percent increases match the raise given to teachers in July. Codere’s raise applies only to the elementary coordinator portion of his contract, Sundblad said. Codere is also a sixth-grade teacher at Lake Linden.